One of the most common and effective soft dressings is the stump shrinker, which is a soft compression sock that fits snuggly onto the residual limb. Stump shrinkers are available in different designs and materials. ACE wraps can be applied while the sutures/staples are still in, whereas the stump shrinker and gel liners are typically ordered by a physician once the sutures/staples have been removed, to avoid wound care issues and infection. Rarely, a physician may request for a stump shrinker to be applied prior to removal of the sutures/staples. In these unique situations, it is imperative for the residual limb to be examined thoroughly and frequently. 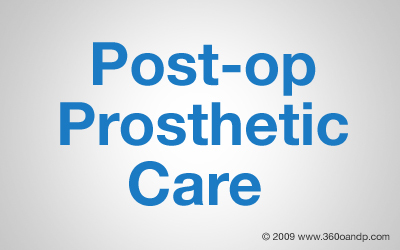 The success of early prosthetic care is directly related to proper wearing protocol and effective communication among all involved medical staff. Skin breakdown and other complications, such as infection, can result if proper protocol is not followed closely. Removable designs not only meet the needs of the surgeon, but also benefit the entire rehabilitation process. The prosthetist is allowed to make adjustments to accommodate for volume changes and to aid in limb shaping. The physical therapist is allowed to perform strengthening and range of motion exercises to the knee. The result is faster healing and a greater chance for successful rehabilitation.